It is normal for a woman to feel some discomfort or cramping during their period, but if a woman's period pain is extreme and much worse than usual, you may be experiencing endometriosis. The Women’s health specialists at Associates in Women's Health in Omaha, NE provide advanced treatment options to women with this painful condition. Endometriosis is a disorder in which a woman's endometrium, the tissue that lines the uterus, grows in other parts of the pelvic region, such as the tissue that lines the pelvis, ovaries, or Fallopian tubes. During a woman's cycle, the endometrial tissue thickens, breaks down, and bleeds. When it has grown in other areas of the pelvis, the blood has nowhere to go, causing extreme pain. The excess tissue may also lead to cysts and scarring that may affect a woman's fertility. Ultrasound - The ultrasound is a noninvasive test that uses sound waves to generate an image of the uterus that may help our team in Omaha see the endometrial tissue. 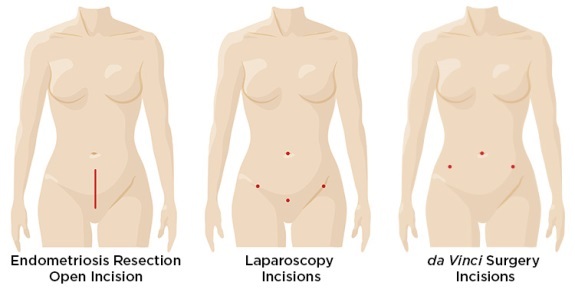 Laparoscopy - The laparoscopy is a surgical procedure in which our Omaha endometriosis specialists use a laparoscope to view the reproductive organs through a small incision in the abdomen. Associates in Women's Healthcare treats endometriosis with medication or surgery. We discusses all options with the patient and decide together how best to manage the disorder and its symptoms. Surgical procedures vary and depend on a woman's pregnancy plans. Our team may be able to take a conservative approach and remove as much of the endometrial tissue as possible through laparoscopic surgery without affecting the reproductive organs. In severe cases of endometriosis, our board certified gynecologists may need to perform a total hysterectomy, which is the removal of the uterus, ovaries, and Fallopian tubes. Our physicians have extensive training in performing robotic gynecology surgery for endometriosis in and around Omaha. To request an appointment give us a call at (402) 697-7200 or visit our online patient portal.